If you don’t live and breathe Concordia politics, you might not understand a lot of the platform points being put forth by CSYou, the lone political group running for office this year. To help you get through the buzzwords, and understand a bit of the context behind each initiative, The Link put together this handy guide of what, exactly, you’re being promised. So it’s no surprise that CSYou is taking a more cautious route this year. They’ve been careful to avoid promising a centre—or anything like it—within their mandate. Rather, they’ve said they’ll spend the year exploring options and researching needs in order to build on the work for future slates. Orientation, cultural nights and most other school-wide events also fall under the mandate of the union’s executive. Current VP Student Life Alexis Suzuki has faced criticism this year for irregular usage of the Events Committee, sub-standard post-mortem reports and a poor attendance rate at council meetings. If elected, CSYou Student Life candidate Katrina Caruso has some big ideas for events. She’s promised the regular features: pub crawls, concerts and parties at The Hive. But she’s also trying to push a few more creative suggestions, such as a “build your own salad” event at the Concordia Greenhouse and business workshops put on in collaboration with the John Molson School of Business. Campaigns for universities to divest from fossil fuel companies have sprung up around Canada. Divest McGill has been petitioning their university since the fall, and current CSU president and VP Sustainability Andrew Roberts has been involved with a similar initiative starting up at Concordia. 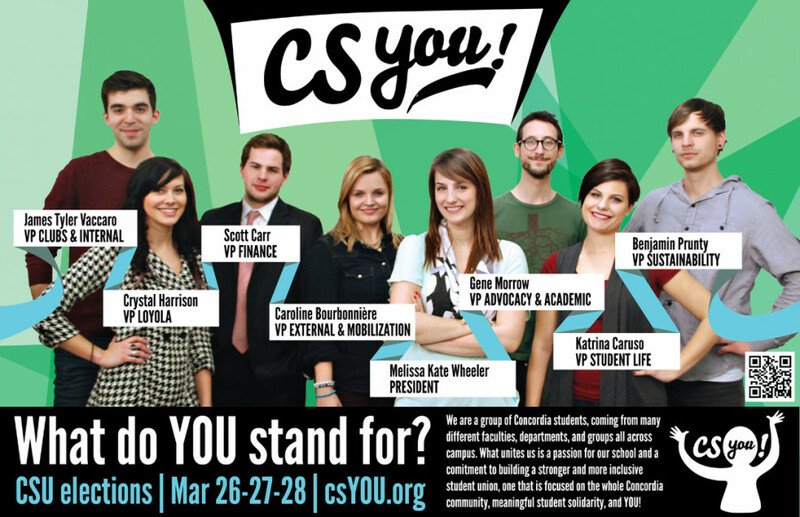 If elected, the CSYou hopes to make divestment one of their main causes. Hoping for a referendum as early as October, the team is looking to get a question about divestment added to the ballot. That sort of mandate from students would empower them to put far more pressure on the university to divest. Located just above the cafeteria on Loyola campus, turning The Hive into a functioning café/bar is sort of the Holy Grail for Concordia politicians. But while many have promised and none have achieved, this year’s slate is taking it to a whole other level. Promising to have a full café up and running by September, they are most likely setting themselves up for failure. But with such high expectations, they could actually get the place selling coffee and muffins by the end of their term, which most Loyola students would be ecstatic about. In 2010, Concordia undergraduate students chose overwhelmingly to leave the Canadian Federation of Students, as 72 per cent of voters said no to the CFS. Several other student unions—including the Graduate Students’ Association at Concordia—did the same that year. The CFS refused to recognize the votes, however, and the CSU sued. A counter-suit followed closely, as the CFS claimed past dues of around $1.8 million. The CSU and GSA have since joined forces, and are slated to head to court two years from now. As such, the CSYou team won’t be going to court, but they still want to make things easier for their successors. Wheeler has promised a CFS awareness campaign, which she believes is integral to galvanizing student support for 2015. When Concordia’s Board of Governors was scaled down last year, student representation on the Board fell from four to one, plus a non-voting member. Meanwhile, independent students continue to be kept out of sitting on either the BoG or Senate, the university’s highest governing academic body. CSYou’s VP Academic and Advocacy Candidate Gene Morrow says he won’t drop the case of independent students until Senate gives him an answer worth defending. Likewise, he says the fight to get a seat back on the BoG is far from over. Reggie’s, Concordia’s campus bar, currently owes the CSU about $1.4 million. More often than not, the bar posts a deficit, which historically befuddles VP Finance candidates who ask how a bar with no rent and minimal overhead struggles so much. CSYou VP Finance candidate Scott Carr is no different. He wants to turn Reggie’s into a profitable bar and feels confident he’ll be able to do so. He also hopes to draft and implement a repayment plan so that the bar can begin working off its debt to the union. Alongside Caruso, he’s looking to rebrand the space and advertise its use for student groups. Since September 2011, the 2110 Centre for Gender Advocacy has been campaigning for a sexual assault centre on campus. Concordia President Alan Shepard has met with them a few times to discuss options, but the centre has been stuck in the early planning stages all year. CSYou is promising one by the end of their mandate—a lofty goal, to be sure. In order to get there, they’ll need to figure out quite a few logistics. How the thing will be funded—maybe a fee levy from students or from university money—will be at the top of the list. But where it is, who runs it and how it operates will certainly take quite a bit of discussion. The team is also discussing trying to implement a “safe space” that is open to students of all needs. If you or anyone you love has lived in residence, you’re probably more familiar than you like with Chartwells. The company running most food options on campus, Chartwells is largely responsible for feeding rez students who must buy a mandatory meal plan to the tune of around $4,000. Concordia’s contract with Chartwells is up for review this year, something that hasn’t gone unnoticed by CSYou. They’re hoping to lobby the school against renewing, hoping for more local options, preferably student-run. But they’re still unsure what should replace the infrastructure needed to feed hundreds of residence students three meals a day. Currently, Concordia’s online classes run through KnowledgeOne, a for-profit company that operates eConcordia. Many of this year’s Senate meetings have focused on improving and expanding e-learning at Concordia, but what that means specifically is still unclear. Morrow is ready for this conversation after two years of sitting on Senate. He hopes to commission internal studies to compare against ones touted by the university. He’s hoping Concordia will focus on improving online classes specifically for students here, as he doesn’t see the merit in trying to imitate work already done by other schools. Concordia shares the distinction as the largest voting member at the Fédération étudiante universitaire du Québec with FAÉCUM—the federation of students at the Université de Montréal. Each has eight voting members. The CSU’s VP External automatically sits on the FEUQ with the understanding that they will work with the external committee and council to bring to the table the wants and needs of Concordia students, who each pay $2.50 a semester to the federation. Caroline Bourbonnière, VP External and Mobilization candidate for CSYou, says the current executive was not enough of a leader on the FEUQ. If elected, she would like to ask each member of the external committee to commit to researching specific topics prior to FEUQ meetings so that Concordia can present and lobby as more of a leader.